Arms belonging to cities, regions, and countries. These are potentially a variation on the arms of the bishopric of Constance (argent a cross gules.) The town belonged to the monastery of Reichenau from 799 until until about the 13th century, and the monastery was subsequently ceded to Constance. It’s possible that later researchers conflated the two. The nearby forest, the Kaiserwald, was frequently used for hunting since the 13th century, which is reflected in the charges here. 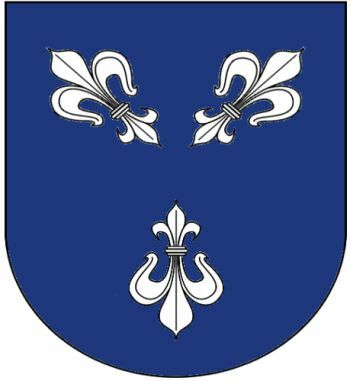 These may partly be canting arms, as “Terrinches” may be derived from “Torreblanca,” or “white tower.” Alternatively, the sinister half of the arms may be a reference to the town’s defensive importance during the Reconquista. The dexter half reflects the town’s previous ownership by the Order of Santiago. The stag is drawn from the arms of the county that shares its name with the village, while the hammers represent the local steelworks and the plowshare stands for agriculture. The earliest records of Dobersberg occur around 1230 in the tithing records of the local monastery of St. George. The name and arms are a reference to the abundance of stone pines in the area, which is unusual for the climate. In use since at least 1987; granted 1974? This village seems to be an entirely distinct entity from the former municipality of the same name in Schwarzwald-Baar-Kreis. The fess dancetty seems to have belong to the Werenwag family, who held the territory until it passed to Württemberg in 1805.